We discuss “American Century” from their last studio album, Blue Horizon (2014), “Master of Disguise” as released on Bare Bones (1999) (the original version, which we also play some bits of, was from Just Testing (1980), and “Roads of Day to Day,” a song recorded in 1970 as a demo before their first album and finally released on First Light (2007). We conclude by listening to “In Crisis” from The The Power Of Eternity (2007). Intro music: “Blowin’ Free” from Argus (1972). 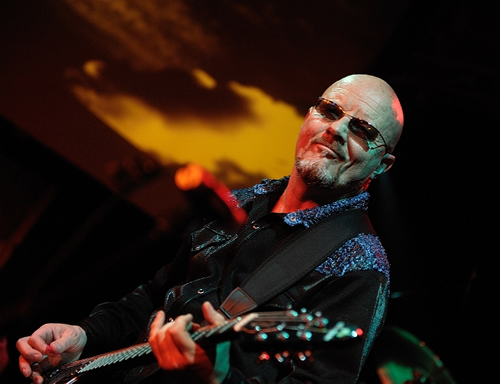 For more info, visit wishboneash.com. Here’s a 2007 live recording of “Roads of Day to Day,” and here’s a live version of “Blowin’ Free.” Here’s the lengthy, jam-based song “Phoenix” that Andy refers to in its original album form. Here’s the original 1980 version of “Master of Disguise” with Martin Turner singing and Laurie Wisefield playing spastic wah-wah guitar. Some quick chronology: The “classic” lineup featured Andy with Martin Turner (bass, main vocals, and most lyrics), Ted Turner (no relation; second guitar, also lead vocals sometimes), and drummer (and sometimes lyricist) Steve Upton. Albums with this lineup are the most revered, especially 1972’s Argus, which any classic rock fan should really memorize. Here’s that band live. Ted left in 1974, so the very acrobatic Laurie Wisefield became the second guitarist. This band fell apart in the early ’80s, with some different singers getting involved (including John Wetton for one album right before his chart success with Asia). Things got very cheesy in the mid-’80s. The original lineup reunited for a couple of albums at the end of the ’80s, and by 1996 the current band template had been established, with Andy working with one of a few successive second guitarists, and by 2006 he was doing all the lead vocals. Their 40th anniversary concert featured a lot of past members guesting in, but none from the ’70s lineups. Original bassist/singer Martin Turner has also toured some with his own lineup playing Wishbone Ash songs, which resulted in a lawsuit over the band name (Andy won). For more info, you can buy Andy’s 2015 book , which was, in part, a response to Martin’s 2012 book , and I also read the pre-lawsuit book Blowin’ Free: Thirty Years of Wishbone Ash , which I think goes into the most song-by-song/tour-by-tour detail. Here’s that New Yorker article Andy refers to on prog rock.